The recent incident, in which an additional director general of police (ADGP) of Gujarat locked up 17 policemen in his garage for more than 16 hours without water, food and electricity to ‘teach them a lesson’ for being “lax in carrying out domestic work” is being interpreted among official circles in Gujarat Sachivalaya as a symptom of brewing rebellion among the women and men in khaki. The policemen were freed them state director general of police (DGP) PC Thakur rushed two senior IPS officers to rescue them from the garage. Those who were locked up by Vipul Vijoy, a 1983 batch IPS officer, in the garage of his official bungalow situated within the Police Training College in Karai, off Gandhinagar, included one sub-inspector, 12 assistant sub-inspectors and four police drivers. The cops were locked following “some altercation over doing work sluggishly”, following which the ADGP ordered them to go inside the garage and locked them up, sources in the Police Bhawan said. The matter came to light after one of the “captives” managed to send out information about their illegal confinement at about 2 pm on September 30, and a local Gujarati TV channel aired the news. Till then, none, not even the DGP, knew of what was happening. “After the news report on the TV channel, the DGP came to know of the incident and rushed two senior IPS officers, KK Ojha and TS Bisht to look into the matter and free the policemen”, the sources pointed out. By the time Ojha and Bisht reached the Karai campus, crew members of local Gujarati TV channels had already reached the stop. They were ordered to move to a distance from the ADGP’s bungalow, where the policemen were kept in confinement. The incident was taken seriously, as among others, DGP Thakur, Gandhinagar range IGP Hasmukh Patel and Gandhinagar district superintendent of police, and the superintendent of the anti-terrorist squad also reached Vijoy’s bungalow, and all the 17 “captives” were freed. While officially the Gujarat government is describing it as a minor matter, with the ADGP wanting to teach the erring and misbehaving cops a “lesson”, Sachivalaya insiders say, the matter cannot be taken “lightly”, as it comes close on the heels of the move to revive a junior cops’ association, banned three decades ago by the Gujarat government headed by Congress chief minister Amarsinh Chaudhury. Former president of the federation of unions of police constables, head constables, sub-inspectors and inspectors, Mukesh Parikh, has appealed the men and women in khaki to “unite” and help revive the association. After holding a meeting, he is learnt to have submitted a memorandum to the DGP with a list of demands. 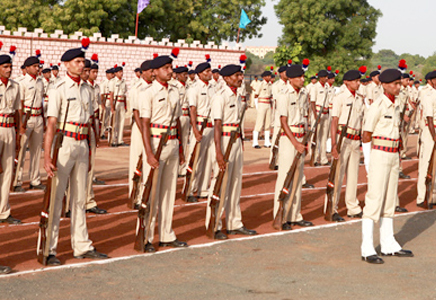 Parikh, accompanied by his comrades, who all have retired from service since the dissolution of the four unions and their federation, have distributed a pamphlet along with rose flowers to cops on duty, including an assistant commissioner of police, and raised slogans “Gujarat Police Zindabad”, “Vande Mataram” and “Bharat Mata Ki Jai”. Parikh said, he would revive the Gujarat Police Parishad (Federation) and has the support for his satyagraha for policemen’s and policewomen’s plight. The demands he has decided to raise include not only recognition of the parishad, but also implementation of the Government of India-appointed sixth pay commission salaries, which has not been done since 2009.